I just love the color of this dish, don't you? It looks like summer on a plate. Salmon, as you know by now, is something I love to eat whether raw in sushi, smoked, baked or seared in a hot pan to get the skin nice and crispy. And salmon cakes are another delicious way to eat my favorite fish. 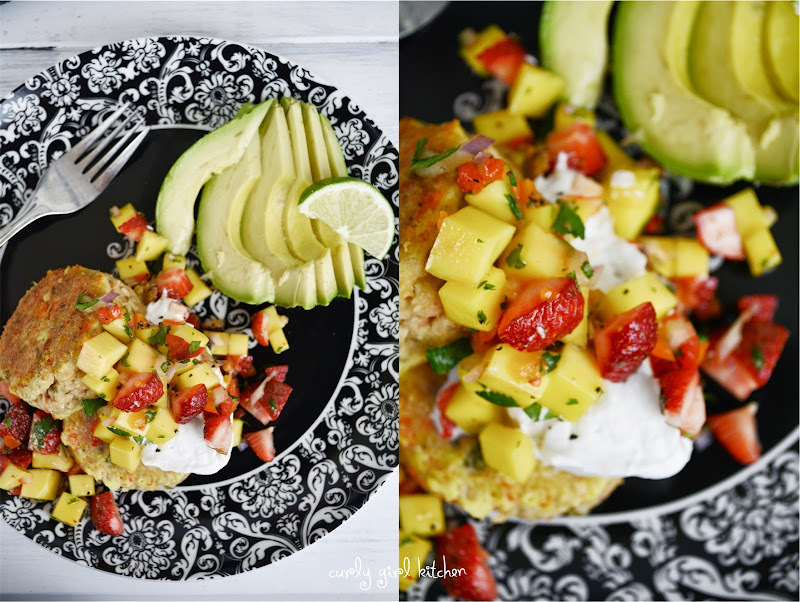 The salmon cakes are seared in coconut oil and then topped with a dollop of coconut cream and strawberry mango salsa for a refreshing summer dinner. Would you believe me if I told you the weather forecast is calling for snow this weekend? In May. All I have to say about that is UGH. In a bowl, combine the salmon, carrot, celery, ginger, jalapeno, garlic, eggs, bread crumbs/flour, salt and pepper, using your hands to thoroughly mix the ingredients. Shape into 8 cakes. Heat a large, cast iron skillet over medium heat until very hot, and add the oil. 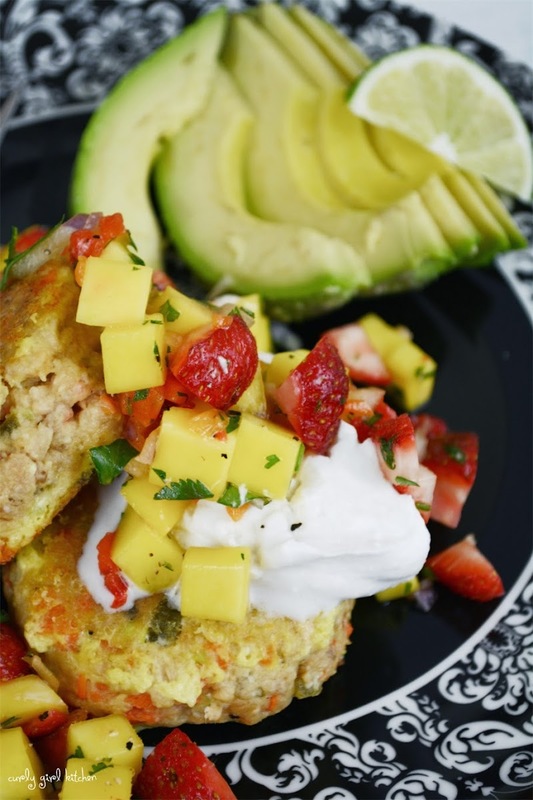 Cook the salmon cakes for 4-5 minutes on each side, until golden brown. 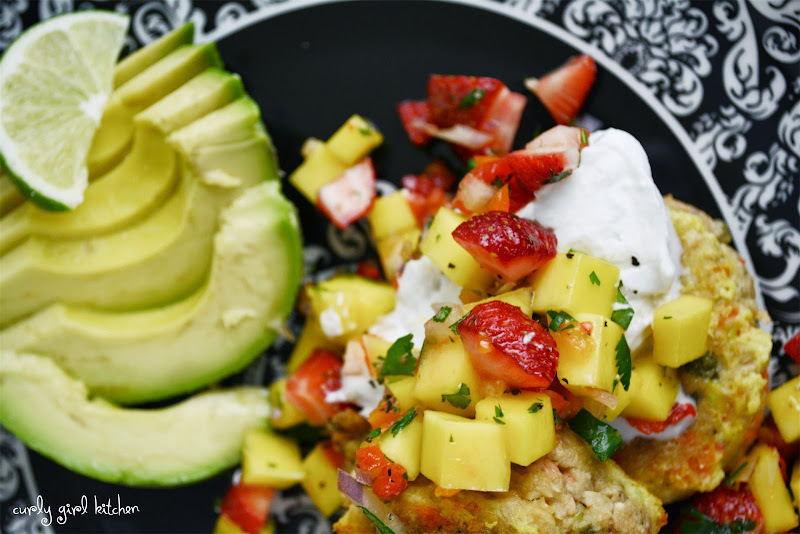 Meanwhile, mix the salsa in another bowl by combining the mango, strawberries, red onion, red pepper, cilantro and lime. Open the bottom end of the chilled coconut milk and pour out the liquid. The top end of the can should be about 2/3 full of hardened coconut cream. Scoop out the cream and use an electric mixer to beat the cream until smooth and fluffy. 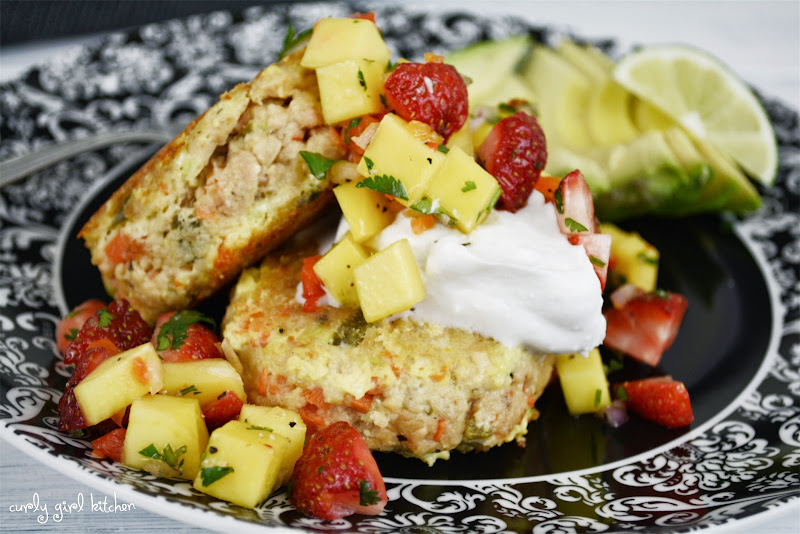 Serve each salmon cake with a spoonful of the coconut cream and salsa.